The Quotations Page is a labor of love created and maintained by Michael Moncur and his wife Laura Moncur. They offer Quotes of the Day , Motivational Quotes of the Day and the usual search function by author and subject. IMDb.com also has a Movie Quote page. Things People Said which a collection of quotes from everyday people. Guess which day of the year is the busiest for most online retailers. Here’s a clue: Its not “Cyber Monday”. Cyber Monday, the Monday after Thanksgiving, when shoppers return to work and their speedy internet connections, has been heralded as the top online shopping day. Turns out it’s really probably the 12th busiest day of the year. But that’s not stopping online retailers from using this term for their own marketing purposes. Read about the myth and the reality in this Business Week article. With all this online shopping, one might think that the paper catalog is a thing of the past. Turns out that catalogs (like many other paper-based products, including books and the clutter on my desk) are not leaving us just because a digital alternative exists. Read why the catalog is here to stay here. P.S. The busiest online shopping day is probably between Dec. 5 and Dec. 15. Some folks either do not understand this or choose to ignore it. An example from the workshop I attended is the Boston Globe reprinting the Declaration of Independence last year. At the end, it says (c)2005 Boston Globe. Interesting because the Declaration is not copyrightable! That's true on two fronts, actually: 1) material printed by the federal government (or what would become same) are not copyrightable - so go ahead, steal away from the Census Bureau, e.g., and 2) even if it HAD been copyrighted, the item by now would have lapsed into the public domain. Remember the notion of "limited". Another example is a realistic photograph taken of the Mona Lisa. It is not copyrightable because there is no creativity involved, though there is some skill. Now if the picture were distorted, or a mustache added, e.g., it might very well be copyrightable. From the Copyright page: Mere listings of ingredients as in recipes, formulas, compounds or prescriptions are not subject to copyright protection. However, where a recipe or formula is accompanied by substantial literary expression in the form of an explanation or directions, or when there is a combination of recipes, as in a cookbook, there may be a basis for copyright protection. Copyright law has changed several times in the 20th Century and it can be tricky to ascertain whether some items are still under copyright or in the public domain. I learned that, due to some quirks in the law that expired in 2003, an unpublished work of Mark Twain, written in 1876, and published in the Atlantic Monthly in 2001, 91 years after the author's death, doesn't lose its copyright until 2048! You can pay the Copyright Office $150 per hour to check the copyright status, or your can try to search the copyright database yourself. You may discover that only part of the item - the introduction, or the annotation, e.g. - is under copyright. Wow . . . now there's a snappy, exciting title! When our clients are buying or selling a business, they sometimes need a formula that they can use to calculate a fair price. We have several books on determining a business' value, but none of them are comprehensive. There are always certain types of businesses for which formulas are not provided. I've come to like one resource in particular, because it does cover a wider scope of businesses. It hails from ValuationResources.com. Here's a link to a sample of their 2006 version (it's a PDF file, just so you know). Page 1 provides a basic review of some pretty simple formulas, while the remaining 8 pages list multiples for various SIC codes. We have the 2004 edition in our collection, and plan on purchasing this 2006 edition very soon. Should you ask for a valuation formula in the future, it's very likely that data from this resource will be part - if not all - of the response. "The PhoneSpell® search engine provides three 4 services in one! You may have heard that now you can take your phone number with you when you move. Enter a 6 to 10 digit phone number and we'll show you what words and phrases your phone number spells to help you decide if you want to keep it. Opening a business and need a new phone number? Pick a new 7 or 8 digit phone number by typing in an available exchange (first 3 to 5 digits) and see what one-word numbers you can choose from. Searching for just the right toll free number to advertise? Type in letters and we will show you the corresponding phone number. We can even dial the number for you!" Its turkey! For many of the major holidays the US Census website prepares fun factoids related to that time of the year, calling them "Facts for Features." Did you know that there are three towns called Turkey in the United States? Or that 1.6 billion pounds of sweet potatoes were produced in the United States in 2005? Yummy. Read more about it here or just click on the turkey on the left side of the main census page, http://www.census.gov/ . Here's the good news: there are annual data available from the American Community Survey. It now covers geographies of 65,000 or more, compared with the 250,000 population limit from last year. The ACS is designed to replace the 2010 Census long form questions. Here's the bad news: because of previous cuts in the Congressional funding, the 2005 ACS does not capture data from group quarters, which include prisons, college dormitories, and nursing homes. So, for instance, the population estimate for the city of Albany - calculated through a different methodology - is 93,523, down from 95,658 in the 2000 Decennial Census. But the 2005 ACS shows 78,404. One cannot make any population comparisons. Depending on the category, one may or may not be able to compare other characteristics either. For instance, 2005 ACS data in a place with dorms will skew older than what's really happening, whereas a place with a large nursing home will skew younger. Data on race, place of birth, veterans status, and all sorts of work data will be different with a large group quarters facility. Yet, politicians and the media have glommed onto these new statistics, making assertions about populations that the methodology does not support. One thing you should get used to is a margin of error figure. For the 2005 ACS population in Albany, it's +/-4,044. This replaces the terms "lower bound" and "upper bound" used in the 2004 ACS, which found data mavens using whichever number was most advantageous. I'm disinclined to tell people not to use these numbers at all, but certainly, one should use them with extreme caution. The Census 2000 data include the population living in both housing units and group quarters. The 2005 ACS only includes the housing unit population. In areas where you feel that the contribution from group quarters is limited [emphasis mine], it is reasonable to make comparisons with Census 2000. For characteristics that Census 2000 tabulated exclusively for the housing unit population, such comparisons are also reasonable. The ACS homepage includes a link to a set of subject definitions. The subject definitions for the 2004 ACS include advice about making comparisons with Census 2000 for each ACS topic. That advice is applicable again for comparing 2005 ACS data with Census 2000. Any monetary estimates from the SF-3 tables must be multiplied by the CPI-U-RS factor 1.13357257. The 109th Congress, which reconvened this week for its post-election "lame duck" session, must still complete action on the majority of funding bills for Fiscal Year 2007 (FY07), including the Science, State, Justice, and Commerce Appropriations measure (H.R. 5672). This week, legislators are expected to complete their leadership elections and to pass a second Continuing Funding Resolution for the fiscal year that began on October 1, before recessing until the first week in December. The House of Representatives approved the Commerce appropriations bill in June; the full Senate has not taken up the Commerce, Justice, and Science Appropriations bill passed by the Senate appropriations panel in July. The first Continuing Resolution in September provided that agencies whose appropriations bill had only passed the House would be funded at the level in the House bill or the Fiscal Year 2006 level, whichever is lower. The House allocated $815.7 million for the Census Bureau, an increase of $14 million over 2006 but $58.3 million below the President’s 2007 request for the agency. Senate appropriators allocated $828 million for the Census Bureau, $50 million below the President’s request. At a July hearing of the House Appropriations Subcommittee on Science, State, Justice, and Commerce, Census Director [Louis] Kincannon [who, along with Deputy Director Hermann Habermann, announced their resignations this week] told lawmakers that the House funding bill would force the agency to abandon plans to use GPS-equipped handheld computers for field data collection, a change that could increase the life-cycle cost of the census by almost $1 billion. The director noted that House-passed cuts in Census Bureau funding primarily affected 2010 census planning activities, leaving the bureau with little flexibility to apply the funding reductions to non-decennial programs. Funding at the House-passed level also could result in cancellation of group quarters coverage in the American Community Survey (ACS), according to the director. Group quarters, which include nursing homes, college dorms, military barracks, and prisons, were first added to the ACS this year. "Ultimately not including the GQ population in the ACS means the ACS cannot fully be the replacement for the long form in 2010," the Census Bureau said in a statement this summer. Census stakeholder organizations, under the auspices of The Census Project, sent a letter in October to prospective House and Senate conferees on the Commerce appropriations bill, urging them to restore full funding for the Census Bureau in FY07, "to help ensure uninterrupted preparations for the 2010 census and continuation of the full American Community Survey (ACS)." The letter was signed by groups representing a wide range of data users, including local governments, science professionals, and social policy advocates. A copy of the letter is available at thecensusproject.org. There are several scenarios for completing action on the remaining nine FY07 spending bills, according to senior congressional staff. Lawmakers could reach agreement on some of the appropriations measures in the lame duck session and send them to the President for signature, either separately or in a package (called an Omnibus Appropriations bill). Alternatively, Congress could fail to reach agreement on some or all of the bills and decide to let the 110th Congress finish the job. In that case, Congress would pass another Continuing Funding Resolution to cover all agencies for which a regular appropriations bill was not enacted, before adjourning sine die. The Science, State, Justice, and Commerce Appropriations bill historically has been among the most contentious of the funding measures. Not a day goes by here without fulfilling a request for a client who needs a list of this business or that. For years, the Research Network used a CD-ROM product called the American Business Disc (ABD) to make these lists possible. Last summer, InfoUSA announced that it was no longer making this CD-ROM available. The company (like every software provider in the information industry) is trying to steer former CD-ROM subscribers towards their web-based equivalent, called Reference USA. Many of you might be familiar with Ref USA. It is a common presence on databases offered for free to cardholders of local public libraries (as well as the New York State Library). If you're not familiar with it . . . you're about to be. Starting later this month, the Research Network will be creating business lists from this website. You shouldn't see much difference in the end product. Oddly, the web version of this product isn't nearly as versatile as the CD-ROM (a lot of useful search features - ones that we relied on - don't exist on the website). We'll have to adapt. The main advantage of Ref USA, though, is that InfoUSA updates the records much more frequently on the web (once per month) than they did with the CD (once every six months, and sometimes longer). They still can't guarantee that every list that you get will be 100% all the time, but the lists you get ought to have fewer dead addresses & phone numbers than before. 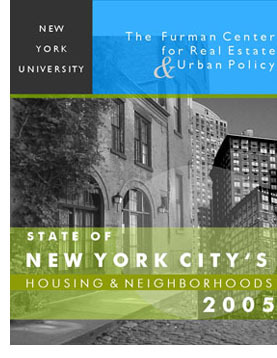 State of New York City's Housing and Neighborhoods 2005. 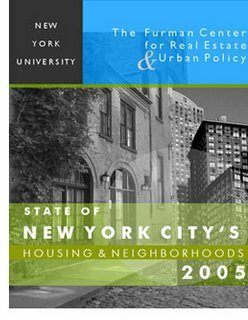 "Every year the Furman Center compiles statistics on housing, demographics and quality of life in New York City’s neighborhoods from a variety of sources. "This edition streamlines the presentation to focus attention on the critical data that reveals how the City, its five boroughs, and its 59 community districts, have fared in recent years. It shows how each of the City’s neighborhoods is progressing, both in absolute terms and in relation to other areas of the City. It provides the first independent analysis of the just-released results of the 2005 Housing and Vacancy Survey. Finally, it adds a chapter analyzing how the affordability and availability of housing has changed between 2002 and 2005." We’ve received a number of questions related to nonprofit organizations lately. The National Center for Charitable Statistics is another good resource for finding information about the US nonprofit sector as well as charitable giving statistics. The number of non-profit organizations in New York 1996-2004 is located here: the data can be broken down by type of nonprofit (i.e. public charities, private foundations) and includes information on asset levels and/or topical areas. More interested in household giving statistics? Try this “Table Wizard,” which will yield reports on giving by state, county or income level. I attended a workshop last month sponsored by the Capital District Library Council, entitled "Copyright and Digitization for Libraries, Archives, and Museums" by Peter B. Hirtle, the Intellectual Property Officer at the Cornell University Library. Fascinating stuff, copyright in the digital age. One of things Mr. Hirtle always makes clear is something we librarians at the Research Network try to make clear when we address one of your copyright, patent, trademark or similar questions, which is what he calls IANAL - I Am Not A Lawyer. For many of the issues, the issues are not black and white, which leads to litigation. Librarians, as users of protected material, have a certain awareness of their obligations. One of the things I DID NOT KNOW is how digitization makes US, the librarians, the users. Whereas when someone goes to the library and uses the copier, or even uses the librarian as his or her agent, the patron is the user. So you'll be seeing some additional verbiage in the documents that we'll be sending to you. Conversely, librarians and archivists have certain specific rights to copy copyrighted works through Section 108 of the Copyright Law as long as it's a single copy, and in the course of our jobs. Read about this in Circular 21. The distinction between "fair use" and infringement may be unclear and not easily defined. There is no specific number of words, lines, or notes that may safely be taken without permission. Acknowledging the source of the copyrighted material does not substitute for obtaining permission. So the parameters are not at all clear. All factors must be weighed, though the courts have been particularly emphasizing the effect on the market. Here's a checklist that may help. Back on September 18th, I wrote a post that described the Research Network's plans on providing information digitally in response to client requests. Today, we took a big step in making this a reality. We'd been experimenting in attaching files (Word docs, Excel sheets, PDF files, HTM pages, etc.) for several months, but it was causing unforeseen problems. Our mail server & your mail server may not agree on certain things (like the size of a file being sent, or whether a message would fall prey to a junk mail filter, etc.). As a result, some messages weren’t being received. So, rather than trying to memorize the quirks of 20+ mail servers around the state, a different method was born. Gus Geidel (our harried but diligent MIS guy) created a section on the main SBDC website in which any of the RN librarians can "drop" a file. More often than not, the file will be several documents stitched together, and saved as a PDF file. The file name will comprise two parts: the advisor's last name, followed by the case number to which the research applies. Once you identify your file, you can either open it & print, or open it & save locally to your hard drive. The file will exist on the website for a brief period of time (we plan on purging every Friday those files over a week old). When your file has been put on the site, you'll get an e-mail that same day from whichever librarian did the work. The body of the e-mail will provide any other details relevant to the research, and it will also provide a link to the web address. We can still attach small files to e-mails & send them to you. It's the larger files that will require use of this new website. There will be no links to this new site from the main SBDC page - it's strictly for New York SBDC personnel. The address should NOT be given out to the client (there'll be other files on there not meant for prying eyes). The site will be bare bones in its aesthetic, so don't expect a masterpiece of visual design. Also, at some point, we'll had some level of security to the site (probably a password function). The RN staff still has to work out internally some kinks on how we're going to utilize this function (there's a bunch of behind-the-scenes stuff that has to get done before a file is posted, and, for our own sanity, we're trying to keep that effort as streamlined as possible). We’re in uncharted waters here. If you've got ideas on how to improve this, we'd like to hear it. But the site is up, and it is running, and we think it's pretty cool. Given the huge popularity of Craig’s List and the spawning of so many other online communities, you may be interested to read this article from Fast Company that offers Craig Newmark’s view of “communities” and how to build them, their shortcomings and best practices. Are You on Craig's List? Craig Newmark has organized a community whose members include some of the Web's most influential people. Here is his manual for (virtual) community organizers. Currently, we at the central office have a subscription to an online image database, and several of the photographs that appear on the SBDC website come from this resource. But, as I make revisions to the website (and I hope you’ll see some of them soon), I’m trying to put up fewer “canned” images and more pictures of our gorgeous clients. Most images on U.S. government websites are in the public domain, and can be freely reproduced and reused without permission. Browse available images from this site- just be careful to check each source’s policies to make sure you’re in the copyright clear before nabbing any images. here) but some can be used commercially and while others can be modified or adapted. Again, just be sure to read the fine print. The Department of Veterans Affairs has put together something called Performance Based Interviewing. PBI "is a method to increase the effectiveness of the interviewing process in selecting and promoting quality staff. With PBI, the interviewer carefully defines the skills needed for the job and structures the interview process to elicit behavioral examples of past performance." One interesting feature is a bank of interview questions designed by the job function. Following each level is a sample question. Level I: Frontline staff, those who do not supervise others. "Give a specific example of a time you had to deal with an upset co-worker, patient, or other customer. What was the person upset about and how did you handle? What was the outcome?" Level II: Work unit leaders, those who lead the work of a natural group of people, either temporarily (process improvement team leader) or as an ongoing role (foreman, section leader). "A part of this job is documenting your work. On a scale of 0 to 10 with 10 being excellent writing skills, how would you rate your writing ability? Give specific example of the types of documents you write routinely. What feedback do you get from your supervisor on your writing skills? " Level III: Mid-level managers, division/department/service line managers, those in charge of a major function in an organization. "Think about a specific time when you had to negotiate with several service chiefs to obtain their cooperation to implement a specific initiative. Tell me specifically how you negotiated with them to attain the desired cooperation and how the implementation of the initiative went. " Level IV: Executive leadership, those responsible for the overall functioning and outcomes of the organization. "Tell me specifically what you have done to create an atmosphere of trust and empowerment within your sphere of influence. What tangible results have you seen from your efforts? " The page has information for those preparing to be interviewed as well as those conducting interviews or training others about PBI. SBA's Office of Advocacy is the primary resource regarding studies of national & state small business trends. On their home page, note a menu on the left-hand side titled "Research & Statistics". A number of links appear beneath that heading, including "State Economic Profiles" (which provides small business data for New York & other states for the individual years 2002-2006, inclusive). Other choices on this menu include "Data on Small Business" and "Owner Demographics," both of which lead to pages that cite reports written by Advocacy over the last several years on a wide variety of topics (including women in business, the availability of financing to small firms, births & deaths of small businesses [a popular choice], etc.). In addition to these, we're often asked to provide historic trends for an industry for a local area. The Census Bureau collects & reports data in its Business Patterns series (the most popular of which is "County Business Patterns," which also has the most data). You can learn the number of small businesses (defined roughly as those with fewer than 500 employees) within a specific NAICS code for one or more counties for individual years 1998 through 2004, inclusive. It takes a bit of back-and-forth, but you can (for example) determine whether the number of small agricultural businesses in Chautauqua County have been on the rise since '98, or not. The New York Times had put most of their opinion columns and online archives behind a subscription wall and called it Times Select. It suddenly cost fifty smackers to access their columnists. Not this week. Polls are open from 6 a.m. to 9 p.m. on Tuesday, November 7. For more information, contact your local Board of Elections and/or the League of Women Voters. The StreetWise Small Business Book of Lists: Hundreds of Lists to Help You reduce Costs, Increase Revenues, and Boost Your Profits. The broad sections in this book are: Starting Up, High Finance, Where you Work, Day-to-Day, Your Taxes, The Geek Section, Your Customers & Prospects, and Your People. Just another good source to add to our repetoire. Money Magazine has prepared several Top 10 lists on the real estate market, including which markets are forecasted to have the fastest growth, slowest growth, and highest and lowest home prices. This page also offers articles and advice on real estate topics.